Ruth Lee GEN2 Fire & Hazard Rescue Training Manikin. A rugged manikin with realistic size, weight distribution, and handling characteristics. The GEN2 manikin has been upgraded with a polyester fabric shell material. It is manufactured using a flexible inner core, an outer shell, and coveralls. The inner core is realistically weighted to human proportions using 4.4 lb packets of aggregate material. For structural integrity, the packets are sewn to a nylon inner core with all the body parts (arms, legs, chest, etc.) which are then held in place with polypropylene webbing. The outer layer consists of the same flame retardant polyester used in police ballistic/stab vests, which typically has four times the strength and abrasion resistance of 16oz canvas or P.V.C. All of the seams are double stitched and are reinforced with high-density polypropylene webbing. This manikin includes a storage loop which is to be used to hang the manikin up to dry. THIS LOOP IS NOT A DRAG HANDLE FOR TRAINING USE. The manikin also includes washable coveralls which protect the manikin from dirt. The coveralls are reinforced with high-density polypropylene webbing in all of the high-stress areas. All GEN2 Fire & Hazard manikins 44 lbs and greater are supplied with lug sole boots that are secured to the manikin. The newly shaped head allows for the fitting of most types of immobilization collars. The red head cover can be removed and washed if it becomes dirty. This new model replaces both the original General Purpose and Haz-Mat Manikins. 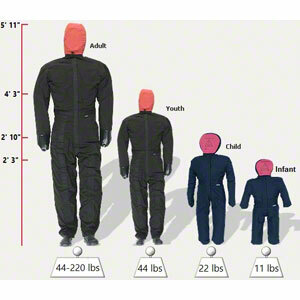 GEN2 Fire & Hazard manikins are available in various weights and sizes from infant to adult, 11 lbs to 220 lbs. Select which size/weight manikin you need from the drop-down window above. All Ruth Lee Rescue Training Manikins include coveralls. Additionally, all manikins 44 lbs and larger also include lug sole boots which are secured to the manikin. None can be found on Bullex products, and Simulaids only adds thin gym shorts. While the strength reinforced coveralls protect the manikin from dirt and such, they are not classified as “Wear Proof”. They are designed specifically to provide a replaceable, washable layer that helps protect the manikin. The coveralls have been designed to wear and must be replaced periodically so that the manikin carcass is protected. Use of the manikins should replicate that of dragging a similarly dressed victim. The wear resistance of the coveralls should be considered as on par with clothing normally worn by victims. The included coveralls protect the manikin when used during rescue training, but they are not designed to endure the rigors of firefighter drags or physical agility training. The coveralls and boots should be viewed as disposable items and should be replaced when showing obvious signs of wear or damage in order to protect the main body of the manikin. Additional clothing is suggested for use in these activities. Even the Combat Challenge manikins are dressed in turnout gear for these competitions. Treat the coveralls as clothing. They are NOT wear-proof. Protect your investment.